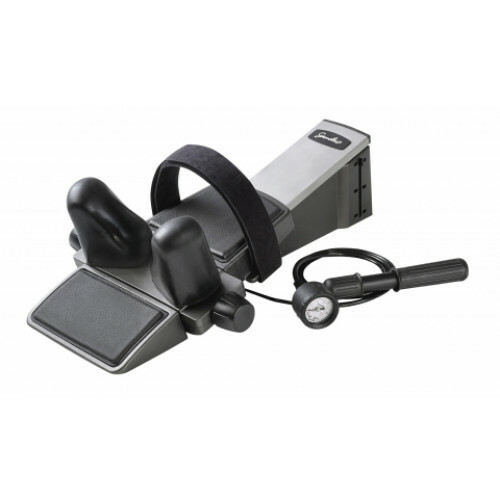 The Saunders Cervical Traction Hometrac Deluxe (model 199594) is one of the most popular devices on the market for producing clinic-like results in the comfort of your home. This cervical traction unit model is designed with ease of use in mind and can be used in the clinic setting or at home for quality traction. The Saunders Cervical HomeTrac Deluxe has a comfortable head rest that is adjustable for providing the appropriate incline for treatment, and features an adjustable pneumatic hand held pump designed to apply up to 50 lbs of traction. Precise traction in 1 lb increments can be administered while relaxing for effective treatment for a variety of cervical conditions. The neck wedges swivel to accommodate different widths of necks and grab onto the mandible of the jaw to prevent loosening around the neck. The Saunders cervical traction device is shipped factory sealed with a simple user's guide and a deluxe carrying case for easy traveling. The Saunders Cervical Hometrac Deluxe model provides traction forces directed toward the occiput (back of the head) and reduces strain on the jaw and neck. Applies up to 50 pounds of effective force. The user has total control of force at all times with the hand-held pneumatic pump. Easy to replicate clinic-quality treatment at home. Patient can control the inclination in the rear from 15 to 25 degrees of flexion with three push-button settings. Includes patented self-adjusting neck wedges that pivot 30 degrees and are removable for easy cleaning or replacement. The rotation of the neck wedges combined with the ability to adjust the width ensures that even patients with extra large or extra small necks can achieve a perfect fit every time! Saunders cervical traction models provide a comfortable and cost-effective option to continuing clinical traction treatments. Great service fast free shipping. I've been using my Saunders Cervical traction home trac deluxe now for about two weeks and it has been very helpful for my neck problems. Thank you for insisting yours was genuine as advertised. I mistakenly ordered from Amazon and got a reconditioned piece that had obviously been used before. I sent it back and ordered from your site - ordering was easy and delivery was as promised. Thank you. The price was the best after searching multiple vendors. It was free shipping. I received the product in perfect condition within time frame. On advice of my doctor, I purchased the Saunders Cervical Traction Device. I am suffering from a pinched nerve that causes numbing and tingling in my left arm. The use of the traction device three days a week has lessened the severity of the symptoms and had no numbing or tingling the last two days. I need to say the ordering process from DME Direct was effortless. Good job guys. I have had some issues with online ordering over the last couple of months and the zero issue ordering and receiving process was extremely welcomed. I was shown how to use this correctly by my physical therapist. Very easy to use at home. Nice that it is portable. Excellent product Review by Mark D.
Received a few weeks ago and have used it a few times. Very easy to set up, easily adjustable and light weight. It has helped with my cervical issues immensely.